Welcome to iPhysics Sandbox, a simplistic physics sandbox (go figure). 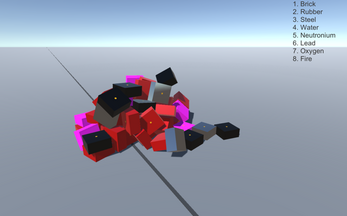 Depending on your personal setting configuration, it's possible to get iPhysics engine to calculate every little attribute of every little object. Some notable features are that all objects have gravity (accurately proportionate to their mass), water coherent to itself, and objects have accurately simulated friction based on their textures. These are not the only features however. Hundreds of hours have been put into this program to ensure it has enough features to suit the user's needs. Wether you just want to mess around, or you want to accurately simulate complicated physics equations, iPhysics Sandbox can be tuned to do it! After creating a simulation, you can save and load it as many times as you want. You can even share the individual save files if you like! Incase a simulation you are running happens very quickly, you can change the program's timescale. If something is very fast, simply slow the timescale! The camera can be easily moved throughout the simulation environment with ergonomically placed controls. There are also customizable speed modifiers you can use to change the camera's speed in real time! If you have a problem, there's no need to go online. The entire manual is built right into iPhysics Sandbox! 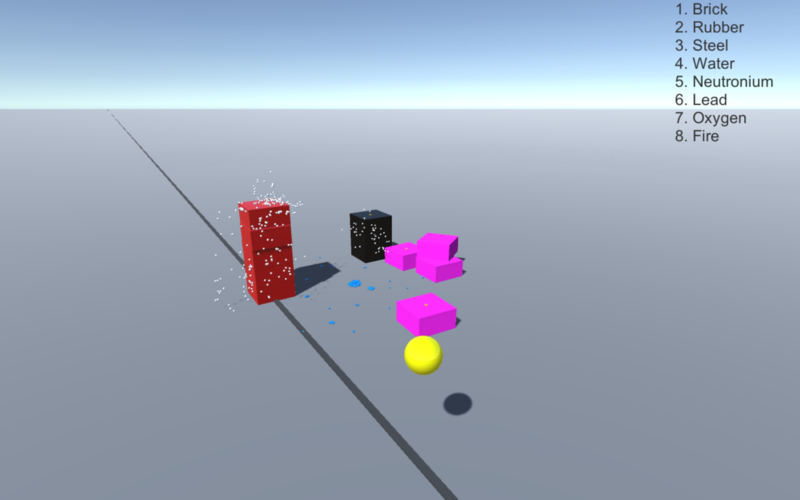 iPhysics Sandbox allows you to edit an object's properties in order to adjust the simulation to run however you like! 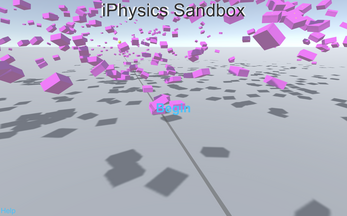 In iPhysics Sandbox, particles will cohere to each-other. This replicates the way water interacts with itself in real life. View a demo here. Every single material in iPhysics Sandbox has accurately simulated gravity. Even though you might not be able to see the effects of the gravity on objects with relatively low mass, with dense materials like "Neutronium" the effects are clear! See a gravity demo here. Gaseous and similar materials (such as oxygen or fire) use an air pressure algorithm in order to replicate real physics. Each particle has this algorithm built in, which ensures an accurate simulation. View an oxygen dispersion demo here. While more advanced simulations required powerful hardware, the standard physics algorithm is very well refined and is very efficient. 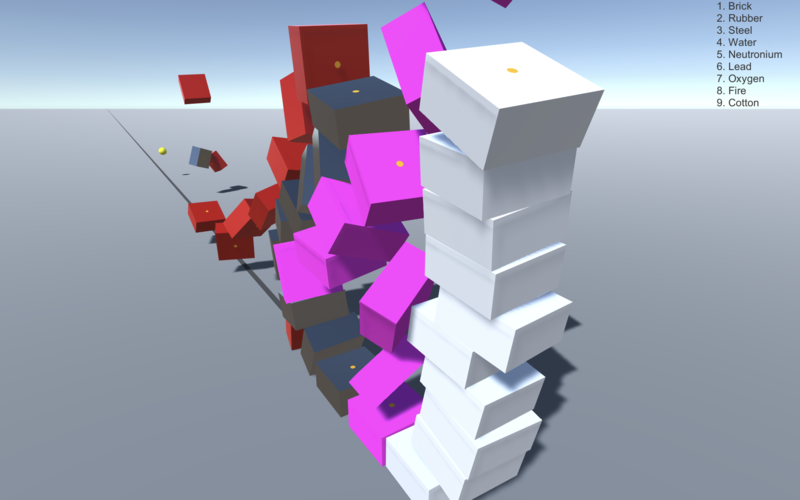 iPhysics Sandbox has no problems with simulating the physics of thousands of objects at once on average hardware. If the simulation is to graphics intensive to run normally, you can always use the time-scaling tool to get better results! To view a physics demo, please click here. This simulation was run on a 2017 MacBook Pro (2.7 GHz Intel Core i7 CPU, 16 GB 2133 MHz LPDDR3 Memory, Radeon Pro 460 4096 MB GPU)..